Traders selling grain, vegetables and livestock came to London Bridge as far back as the 11th century. The market then relocated to what is now known as Borough High Street in the 13th century, and a food market has existed here ever since. 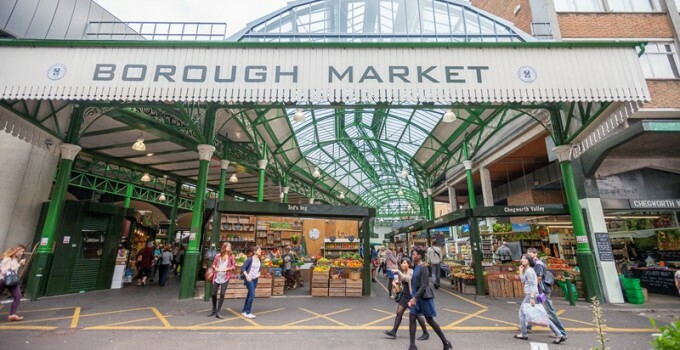 In more recent times Borough Market has become renowned in London and around the world for selling the widest range of exceptional British and international produce. Slow Food is a worldwide movement that supports a low impact approach to food production, with an emphasis on localised traditions and customs. Its philosophy closely mirrors that of Borough Market, and in recent years the ties between the two organisations have become increasingly close. The Market is filled with traders whose approach to producing or sourcing has gained them official accreditation from Slow Food England and the honour of numerous awards from Slow Food members. Many of the products sold here have also been recognised by Slow Food as distinctive local foodstuffs whose survival would be at risk if it weren’t for a small number of artisans working hard to keep them relevant. In fact it would be hard to find a denser concentration of Slow Food products anywhere else in the UK. You can read more about Borough Market’s Slow Food accredited traders and products in Market Life’s regular Standard Bearers and Survival Instincts strands on the website boroughmarket.org.uk and sign up to the newsletter to keep a finger on the pulse of London’s most famous market. Food is after all, at the heart of everything we do.